With Walter White behind him, multiple Emmy® winner Bryan Cranston (Breaking Bad) found another indelible role: President Lyndon B. Johnson. After winning a Tony® for his performance as LBJ in Robert Schenkkan's 2014 Broadway play, Cranston returned to lead the HBO movie version and won a Golden Globe®. 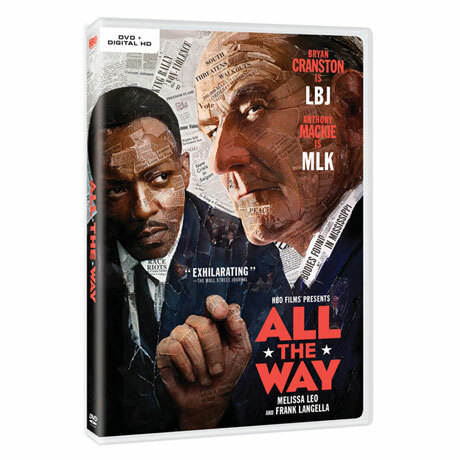 With Oscar® winner Melissa Leo as Lady Bird, Anthony Mackie as Dr. Martin Luther King Jr., and Bradley Whitford (The West Wing) as Sen. Hubert Humphrey, it's "exhilarating" (Wall Street Journal). 2 ¼ hrs, 1 DVD. Mature audiences.